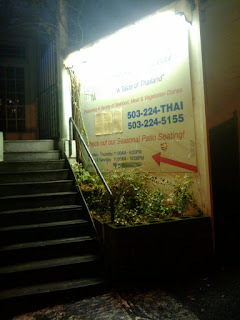 Sunday night we ate at Baan Thai, which as you can see in this image is up a small flight of stairs, and it was fantastic. The waiter had warned us ahead of ordering that the chilies were extra hot this time of season, so we opted for the mildest dishes and some of them were still really hot. Our order included Baan Thai eggplant, yellow curry, spicy crunchy chicken and beef fat with vegetables. It was all so delicious. After wards we went to a house party and had a great time with some good people. Today I tried to get myself to the Velvet Painting Museum but I passed on that gem and chose to meet some people down on Hawthorne for some Seinfeld-esque diner food. I was Kramer. Someday s its just good to be Kramer. Yesterday I had posted my Top Ten LP's of 2009. Here is the list of LP's that didnt make it or weren't released in 2009.